MANILA - A weather system being monitored in the Pacific Ocean can develop into a "supertyphoon" while inside the Philippine area of responsibility, the state weather bureau said Monday. 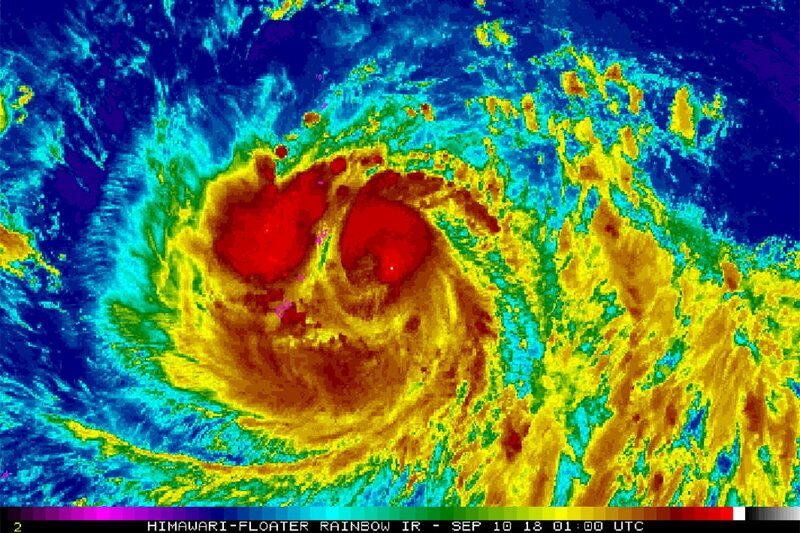 Typhoon Mangkhut is packing 140 kph maximum sustained winds and gusts of up to 170 kph and can enter PAR by Wednesday, according to the latest bulletin from PAGASA. Cloudy skies with scattered rainshowers and thunderstorms over the whole Luzon can be expected on Thursday, weather forecaster Ezra Bulquerin told ANC's Dateline Philippines. Western sections of Visayas and Mindanao will also have the effect of the enhanced southwest monsoon which could bring moderate to occasionally heavy rains, he said. In a separate monitoring by ABS-CBN News, Mangkhut, which will be named "Ompong" once inside PAR, will come in packing sustained winds of 215 kph but can develop into a supertyphoon within the next 12 to 24 hours. PAGASA categorizes a weather system with maximum sustained winds of 220 kph as a supertyphoon, but Ompong can carry winds of up to 250 kph before it leaves the Philippines as it approaches extreme northern Luzon, said ABS-CBN resident weather specialist Nilo Millanes. Typhoon "Maymay" (international name: "Jebi") also packed winds of 250 kph, he said. Its winds will weaken to 240 kph as it leaves PAR on late Saturday, he said. "Its outer rain bands as well as its western outer strong winds of 63 km/h (signal no. 2) will start to affect Cagayan and Isabela late Friday morning. The worst scenario for this typhoon, based on this latest forecast track from [Joint Typhoon Warning Center] is for 'Mangkhut' to cross the Babuyan Group of Islands on Saturday morning with strength of 240 kph near the center," he said. Very strong winds and heavy to torrential rains will affect this area including the rest of Cagayan and Northern Isabela and the provinces of Apayao, Kalinga, Ilocos Norte, Ilocos Sur, and the Batanes Island Group. Metro Manila will experience occasional light to moderate rains, he added. Ompong will traverse its path with a speed of 30 kph, as fast as supertyphoon Yolanda, which devastated parts of Visayas, said Millanes. The rest of Northern Luzon will also have rains and gusty winds during its passage especially the rest of Ilocos and Cordillera Administrative Regions due to its outer circulation. The rest of Luzon will likely have cloudy skies with occasional to intermittent light to moderate rains, becoming at times heavy in western side of Central Luzon during Mangkhut’s passage due to Southwest Monsoon. Meanwhile, the Japan Meteorological Agency estimated Mangkhut's current strength at 150 kph, same with JTWC’s. However, the JMA does not expect the weather disturbance to become a super typhoon. The strongest winds Mangkhut will attain as per JMA’s forecast is 205 kph on Thursday until it is over Extreme Northern Luzon.